There are already some threads regarding Ayatana libraries not compiling on Arch. Ive finally managed to make (ok, mostly i didnt made them, but tuned others work to compile) proper, working PKGBUILDs for this libraries, i plan also packaging new, Ayatana applets like Sound Menu, so i decided to start official thread for all Ayatana requests, bugs, etc. Please look also on my icons and themes thread. You can also check newest information about my packages on twitter - @dinth1906. If you want to get better Ayatana experience, install only mine development (bzr) packages. Mixing this with stable packages made by other people on AUR should work, but i cannot guarantee that this will work and will not eat your cat - nobody ever tested this. Feel warned and install manually only -bzr packages. How can You contribute and help me? You can contact me on Jabber or MSN - my account is "dinth1906@gmail.com" on both. * what is "indicator applet appmenu" and why it isnt working ? * evolution isnt showing in indicator-messages, when run from autostart. running manually works. Is this related to Colibri? I dont think so. Ayatana is Ubuntu usablity project, which contains notify-osd (GNOME precursor of Colibri), and also libdbusmenu, libindicate, libindicator, indicator-applet, and many applet menus. Can you please make a wiki page on wiki.archlinux.org for Ayatana? I think that could be useful. I will try when i'll make some more Ayatana packages, but im not very good in english. I also have many problems with unity dependencies. hmm indicator-application showing "No indicators" in gnome-panel.. This is appmenu indicator, not indicator-application. Im not sure, but i think that propably this should display something like global menu..
Ive made indicator-network package, indicator-weather (but ive got trouble with running it, it cannot find my city, maybe some problem with national chars), and finally updated libindicate to newest trunk version (unfortunatelly without mono bindings, which i cannot compile under Arch). unfortunatelly this .c file is generated from .vala file in make process, so to compile with it, i must first do ./make, which fails, then patch generated .c file, and run another ./make; cannot do this in PKGBUILD unfortunatelly, because fail of first make causes fail of makepkg. Wow man, great job ! Probably not related, but did you by any chance managed to get Gwibber (http://aur.archlinux.org/packages.php?ID=24544) working with libwebkit 1.2.1? I also want to contribute to this, however I don't know much about packaging but I would be happy to read, learn and help out. Would you mind sharing what parts of the arch wiki you read to get started working with packages/aur? Ryuujin: when i learned (and i learn all the time, im not pkgbuild mastah) i took example file, try to change it to my needs, and when i dont know how to do something, i look in other pkgbuilds. If you want to contribute, but arent really into pkgbuilds, you can help with arch wiki page or testing existing pkgbuilds - this are bzr pkgbuilds, so it is possible that some revisions wouldnt compile or must have additional patches, and also there are lots of unresolved bugs, like indicator-sound dont showing rhythmbox controlls (if it needs some kind of rhythmbox version, or patch/extensions), or indicator-session (it cannot reboot computer, if it needs hal, or some permissions for user, etc). @Dinth: How is the indicator-applet coming along? Last time I checked, I could not get any apps to show up in it? I'm particularly interested in rhythmbox. i compiled the packages, but with a couple of changes. Hey Dinth, I noticed that you packages in the AUR mistakenly point to caarlos0's packages. You should probably fix this so that someone installing one of your "bzr" packages will aquire only bzr packages. Currently, If i install "indicator-applet-bzr" from the AUR using yaourt, it will also install the dependencies from caarlos0. It won't install the bzr dependencies. It says indicator-applet-bzr depends on indicator-messages and indicator-sessions, but instead it should depend on indicator-messages-bzr and indicator-sessions-bzr! joe@trusktr.io - joe at true skater dot io. By the way, would we use the indicator applet to replace the "notification area" applet? I realy like your builds. Since we're near the official ubuntu 10.10 Why don't you use the « official » ayatana realese (or upgrade the non-bzr aur) ? It work's Thank's. Hope we soon get a simplier way to installe the ayatana* things. if you really want g-i support, you have to wait until gnome 2.32 is released and g-i 0.9.6 is in the repos. 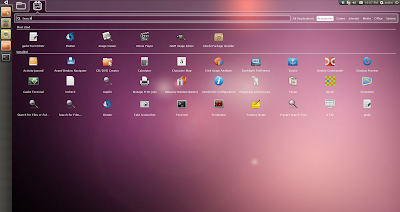 ubuntu-desktop - to get an all the ubuntu desktop packages installed.